I have tried using Mary Kay Time Wise Matte-Wear Liquid Foundation a year ago when a friend offered it to me. I bought 2 tubes. It has the nicest and flawless coverage when finishing off with a pressed powder. It never caked. I got excited when Mary Kay offers the Beauty On-the-Go Starter Kit. Each Kit includes a Botanical Effects Evolution Cleansing Gel, an On-the-Go Mineral Pressed Powder (in Ivory 2), a Gel Semi-Shine Lipstick (in Red Smolder), and a Brow Definer Pencil (in Brunette). The newest make up trend, the hottest fashion find, the up-and-coming food hub in the neighborhood, not to mention your weekly fix of salted egg chips and craft coffee – there’s just so much a girl’s got to spend on! As if sourcing the funds weren’t already a challenge on its own, these days, that’s not all we think about. Sometimes, more than the dent it’s going to make on our bank accounts, we’re concerned about finding the sacred time to be able to do these things in between our full-time jobs, #adulting chores, and Manila traffic. Mary Kay Philippines, one of the biggest skin care and cosmetic companies in the world, throws our drowning wallets and schedules a lifeline as it launches the Beauty On-the-Go Starter Kit. A beauty and skin care arsenal that you can purchase when you sign up to be a Mary Kay Independent Beauty Consultant, this lifesaver lets you be the ultimate #girlboss for only PHP 1,500.00. A good-paying job with a flexible working schedule where you can operate at your own pace and time – sounds like a unicorn, right? Not really! Mary Kay Independent Beauty Consultants, aka #girlbosses, get to enjoy all that. When Mary Kay Ash, the beauty company’s namesake, founded the brand over 5 decades ago, her cause was clear and simple: to enrich and elevate the lives of women all over the world. On top of great products, Mary Kay Ash also envisioned giving women the opportunity to achieve success, while balancing their lives around their values and priorities. Mary Kay, through its direct-selling model, allows its Independent Beauty Consultants to avail themselves of high-quality beauty and skin care products for a significantly lower price, which they may then sell for a profit. When, where, and how these beauty and skin care bosses do it is entirely up to them. Great conversation skills, mad graphic designing powers, brilliant make up expertise – strengths and passions take center stage in the #girlboss business of Mary Kay. If you’re a social butterfly who thrives in parties and gatherings, maybe this means building networks of loyal customers. If you’ve got a great eye for style and design, perhaps this means coming up with beautiful online content to keep buyers coming. If you’re a make up extraordinaire, then maybe it’s all about knowing what works and what doesn’t work for each of your clients. Have the chance to do what you love, get better at it, and earn a pretty penny while at it too! Inside the Beauty On-the-Go Starter Kit are beauty and skincare must-haves that Independent Beauty Consultants can sell in their own time and for their own profit. Each Kit includes a Botanical Effects Evolution Cleansing Gel, an On-the-Go Mineral Pressed Powder (in Ivory 2), a Gel Semi-Shine Lipstick (in Red Smolder), and a Brow Definer Pencil (in Brunette). Also included in the Kit are new and exciting literatures and makeover tools that are designed to help beauty consultants conquer the world one beauty junkie at a time. Of course, every #girlboss makes sure to dress to slay. 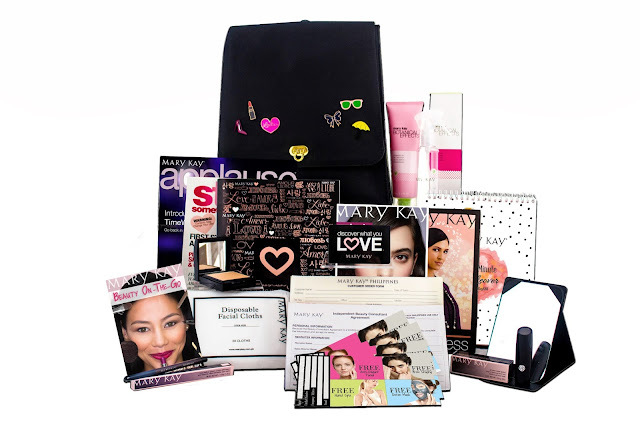 Mary Kay Philippines has got that base covered because the Beauty On-the-Go Starter Kit is an incredibly stylish black bag adorned with fun and colorful patches, and may be worn as a shoulder bag, a backpack, or a cross body bag, making it the ultimate accessory to complete your look. The all-in-one fashion accessory and beauty war chest is sure to be a hit among the beauty conscious urbanites. One of the reasons why there are millions of loyal Mary Kay customers in Manila and around the world is because Mary Kay products consistently deliver the benefits women want at prices they can afford. Mary Kay’s global team of scientists uses the most advanced skin care ingredients and technology available to ensure that women get what they want – from cutting edge skin care to bold color cosmetics and fragrances. Get ready to kiss #FOMO goodbye with the Mary Kay Beauty On-the-Go Starter Kit. Alternatively, Mary Kay also offers the TimeWise® Starter Kit, also at PHP 1,500.00, which includes anti-aging products. Simply visit the Mary Kay Beauty Center to sign up to be an Independent Beauty Consultant, to purchase the Starter Kit, and to learn more about Mary Kay products. For more information, you may visit the Mary Kay Beauty Center at the 2nd Floor of the Allegro Center, 2284 Pasong Tamo Extension (Makati City), G/F, Philam Life, Rizal Street (Davao City), and 2/F YPC Building, Veteran’s Avenue 7000 (Zamboanga City). You may also call 859-MARY (859-6279) in Makati City, (082) 224-5956 in Davao City, and (062) 992-6222 in Zamboanga City. You may also visit www.marykay.com.ph, MaryKayPhilippines on Facebook and YouTube, and @ilovemarykayph on Twitter and Instagram.